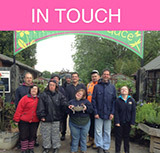 There are many ways in which you can raise money for the work we do at COT. The great thing about fundraising is it can involve almost any activity giving you the opportunity to develop your interests or get fit at the same time as doing good. What could be better. We'd love to hear from you if you've got an idea. Most people would agree that collecting sponsorship money used to be a real chore, but nowadays, with the internet, it has never been easier. At the click of a button at www.justgiving.com you can email your sponsorship form to your friends and contacts who then give on-line directly to us - no more tedious pledge chasing and cash handling! Click here for a readymade sponsorship form to download. Click here to watch Tom Smith’s skydive that he completed in 2013 for COT!